(Relaxnews) - In just a few weeks and for a limited time, different parts of the Earth will enter the stage before winter when Mother Nature puts on one of her greatest shows: a fireworks display of orange, red, gold and brown. From the wine-growing regions of France to the mystic mountains of China, editors at travel guide Lonely Planet have curated a list of the most stunning fall foliage destinations for lovers of the most melancholic and striking of the four seasons. Fall is perhaps one of the best times to visit the Loire Valley, when the vineyards turn shades of buttery yellows, burnt oranges and reds and the winemakers are busy with the fall harvest. Take in the view with a glass of wine, maybe at one of the many castles which dot the Loire River, the longest in France. Autumn will surely become your favourite season if it isn't already. Every year, Chinese tourists make a pilgrimage to Yellow Mountain where “wispy clouds” lend the forested mountain peaks an “ethereal” and exotic atmosphere, says Lonely Planet. Best time to visit: at sunrise. When you’re not rooted to the ground tree-gazing at the ancient woodlands of Gloucestershire, the Forest of Dean also offers a variety of activities such as mountain biking, treetop zipwires, kayaking, and castles in the vicinity. In addition to miles of hiking trails and scenic drives that take visitors over covered bridges, past historic sites, through picturesque towns and villages all against Technicolor foliage, the White Mountains area also boasts 100 waterfalls. 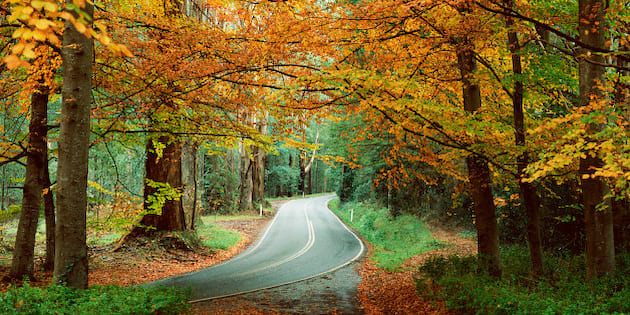 Peak foliage typically occurs from the end of September through the second week of October.